7 Din Muhabbat In To Hit Cinemas On Eid-ul-Fitr 2018. 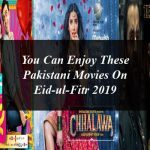 7 Din Muhabbat In is another Pakistani movie which is all set to release on Eid-ul-Fitr-2108 in the country. A new Pakistani Movie 7 Din Muhabbat In features the most admirable beauty none other than Mahira Khan along with Shehryar Munawar. Both the stars were appeared together in “Ho Mann Jahan” and now once again will perform in this Pakistani Movie . The new Pakistani Movie 7 Din Muhabbat In is touted as the Romantic Comedy but also with the touch of action and drama. Here you can watch the official Trailer of the Pakistani Movie 7 Din Muhabbat In.